Year of the player: Generally speaking, rookie cards are more valuable than cards that are released the following years. An autographed rookie card of Nicklas Backstrom is worth much more than an autographed Backstrom card from a 2015 product. Product where the card is from: The product plays a he­­avy role in determining the value. Card companies make products for collectors of all budgets. Because of this, it is important to understand cards from a more expensive product are typically worth more than those of a lesser priced product. Rarity: Figuring out the rarity of a card can be easy sometimes. Cards that contain player signatures or pieces of jersey may be numbered. However, this isn’t always the case. There are many cards that aren’t numbered but are considered “rare”. The best way to work around this is by simply searching online for the checklist of the product that card came from. A checklist may label cards as “SP” (short printed) or even “SSP” (super short printed). Although “SP” and “SSP” sound ambiguous, an online/hard copy checklist may contain a legend stating the rarity of “SP” and “SSP”. *Cards that are numbered “1/1” are a one of a kind card thus the owner has full control of its value. There are other factors I didn’t explain however the 3 listed above are usually the most useful in valuing cards. If there is one card featuring a Caps player that can be dubbed the “Holy Grail” of Caps cards it has to be the card pictured below: Sold for $5,231 (eBay item #: 141715432813). Ungraded versions can sell for $4500 depending on the patch. As far as “The Cup” rookie patch autographed cards go, only Sidney Crosby’s version is more valuable. It is important to note that “The Cup” is an incredibly expensive product made by Upper Deck. One box typically sells for $400-$550 depending on the year. Also, “The Cup” cards are so thick (roughly 180 PT) that getting a BGS (Beckett Grading Service) score of a 9 is very difficult. To put all this into perspective, this card is the best card featuring a Caps player ever created and it has the 2nd highest grade obtainable. *There may be 1/1 Caps cards listed on eBay for more money than this card however 1/1 cards lack a specific value. 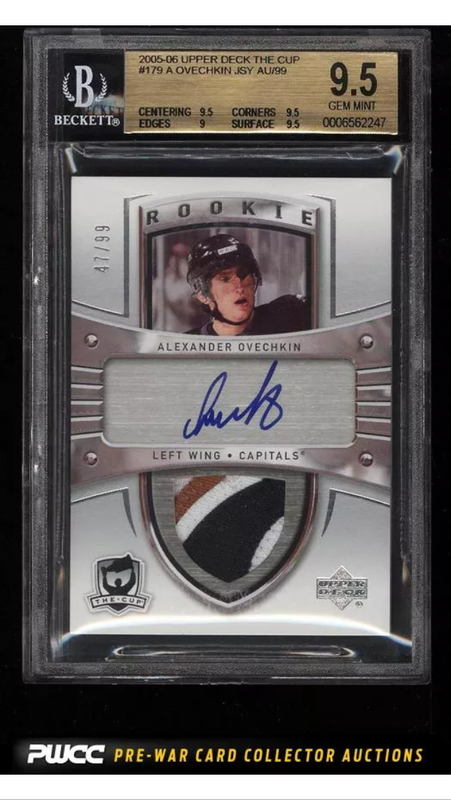 This Ovechkin card has a specific book value unlike 1/1’s. I personally own the Backstrom card on the left. The card on the right is from an eBay auction (eBay item #: 321819217696). Panini had been releasing “Prime Colors” cards for 3 years prior to losing their hockey card licensing rights. Upper Deck has just recently started to release their version of “Prime Colors”. Valuing these cards is basically all up to the owner of these cards. The reason is because almost every one of these cards has strikingly different patches on them. Factors such as the player, the patch itself, and rarity numbering all play a role in calculating a ballpark value for these cards. I obtained the left Backstrom card through exchanging offers back and forth until the seller and I met somewhere in the middle of the original asking price. The Backstrom card on the right is currently at $9 in an auction that has 5 days left to go before ending. For those interested in this particular Backstrom card, I recommend looking up on eBay how much do these types’ cards sell for. If a Claude Giroux card that has a giant patch of some black and white of the Flyers wing sold for $40 on bidding, one can theorize the Backstrom card is worth roughly $40. 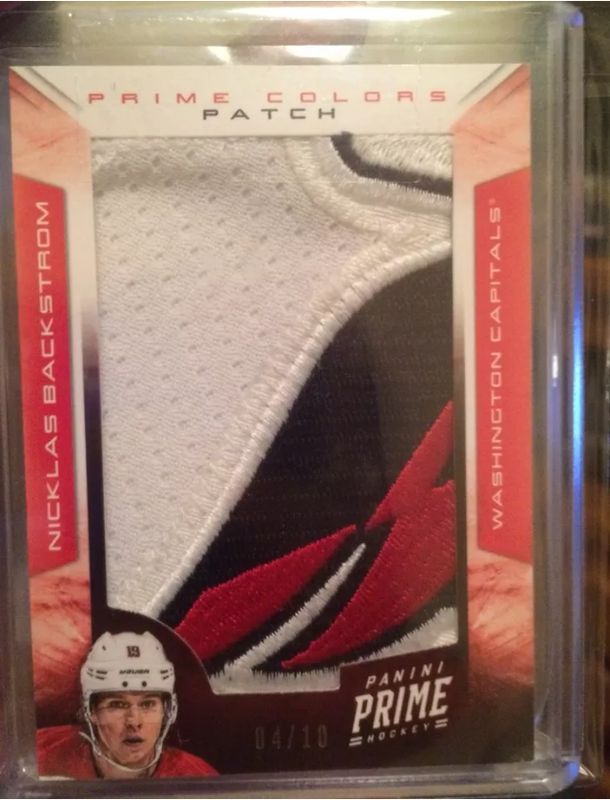 This card is currently being sold for $125 with the option to make an offer (ebay item #:191386280679). Based off my research and experience with these cards, $125 or make offer is a very fair deal. Although Mike Green is no longer with the Capitals, his patch adds great value considering it is likely from one of the shoulder patches of the away jersey. 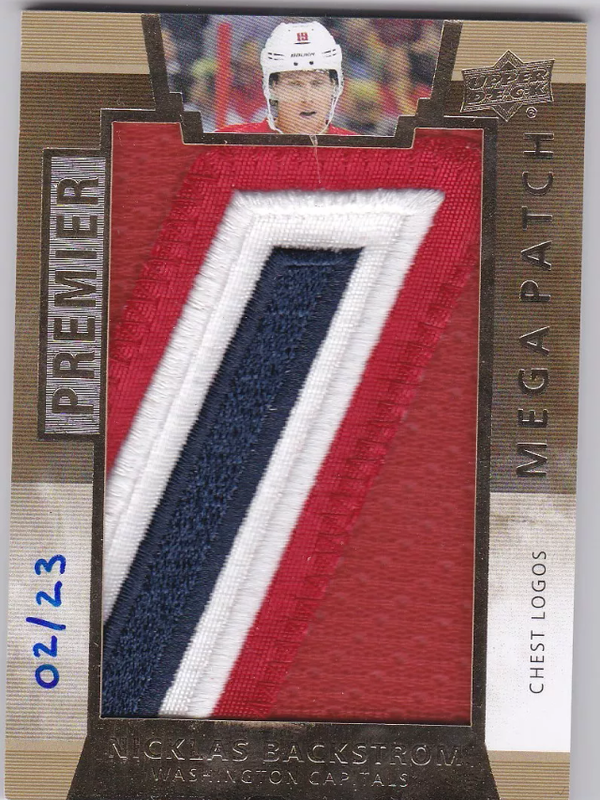 On top of this, Ovechkin’s patch is from the eagle’s head while Backstrom’s and Holtby’s are multi-colored. It is possible for novice collectors to over value the card considering it consists of great patches of 3 of the franchise players on the team. These collectors might even consider that a box of 13-14 The Cup is valued at roughly $400 and that the card is worth close to $400. Whenever you are in doubt in regards to the value of a card, it is always good to see what other cards like the card you are after sell for. In this age of card collecting, it is important to keep up with the latest trends and products as they are evolving year after year. This yearly pattern will likely take a slight stumble considering Upper Deck is entering their first year as the only card company with NHL card licensing rights. It is important to remember that values of cards are always changing. There was a time when Filip Forsberg cards were worth next to nothing but now they are amongst the most sought after cards from the 13-14 rookie class. It certainly helps to know about most/all of the players in the organization. Cards of an established elite all star like Ovechkin have generally consistent values year after year. However, cards of an up and coming prospect such as Jakub Vrana will have constantly changing values until his future with the team becomes clearer. I hope this article provided a better understanding of values of Capitals cards. Happy collecting Caps fans! This entry was posted in Collecting, Memorabilia and tagged hockey cards, Mike Rangel. Bookmark the permalink.